Ukraine Megalot is one of Ukraine’s most popular lotteries. It’s a bi-weekly lottery that offers eight prize tiers and lump sum payouts. What makes it more enticing is the fact that jackpot rollovers are uncapped, so seeing huge prizes should come as a surprise. The odds are pretty decent as well. What else does Ukraine Megalot have on offer? Find out below as I take a deep dive! Established way back in 2001, Ukraine Megalot is not only one of the country’s most popular lotteries—it is also proven to be one of its more simple yet exciting ones. 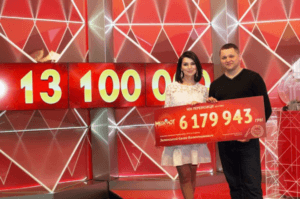 Operated by Molodsportloto (or MSL, for short), Ukraine Megalot offers two multi-million prizes every draw—one for the jackpot winner, another for the second-tier win. Beyond that, the game utilizes an easy 6/42 plus 1/10 format that has remained the largely the same since its launch. Bi-Weekly Draws: Each week, you have two chances to win as Ukraine Megalot draws are held every Wednesdays and Saturdays. Jackpot Rollover: Should no one win the jackpot, it will simply roll over to the succeeding draw—essentially increasing the prize fund—until someone wins. Eight Ways to Win: Uktraine Megalot offers a total of eight prize tiers—so even if you don’t win the jackpot, you could still win in seven other prize categories. Decent Odds: Compared to more popular lotteries, Ukraine Megalot’s odds are fairly decent. Paid Out in Lump Sum: All Ukraine Megalot prizes are paid out in lump sum form, so you can enjoy your winnings immediately. How Does Ukraine Megalot Work? Ukraine Megalot is a pretty straightforward lottery game—which should delight both newcomers and veterans alike. Players simply have to choose six main numbers from a number pool ranging 1 to 42, plus a bonus number—known as the Megaball—from a pool ranging from 0 to 9. For an additional cost, Ukraine Megalot allows players to select more than one bonus number. You can choose up to a maximum of 10 bonus numbers. The advantage of ponying up more cash for more Megaball numbers is, of course, increased chances of winning the jackpot, as well as the 3rd, 5th and 7th prize categories. Speaking of winning, players must match all six main numbers plus the Megaball to win the jackpot. Meanwhile, winning the 2nd prize tier—also known as the Megapriz—requires you to match just six of your main numbers—no need for the Megaball. The 3rd prize tier, on the other hand, requires you to match five main numbers along with the Megaball. Ukraine Megalot offers a total of eight prize tiers—where you only need to match at least three main numbers to win anything. Meanwhile, if nobody wins the jackpot, a rollover will occur. For the uninitiated, this simply means that the jackpot will be added on top of the next draw’s prize fund, thereby increasing in value. Even better, unlike other lotteries, Ukraine Megalot’s rollovers are uncapped. In other words, jackpots can keep growing without limits until someone finally wins. If you win the jackpot along with other players, it’s important to note that the prize will be equally split among everyone. Equally important is the fact that all prizes—including the jackpot—are paid out in lump sum form. So, no—you can’t choose to receive your money on an annual basis. As for taxes, it used to be that deductions were pretty harsh on winners—so much so that they would be subjected to taxes multiple times. However, as of the latter half of 2015, a new legislation was passed that made tax deductions a bit easier to swallow. Prizes up to UAH50 at any MSL Lotto retailers. For prizes between UAH51 and UAH3,000, you can also claim prizes at any authorized retailer. But, if they don’t have the available funds, you must claim your prize at any MSL regional office. Meanwhile, for prizes between UAH3,001 and UAH10,000, winners can make a claim at an MSL regional office. Any prize beyond the aforementioned threshold would have to be claimed at the MSL headquarters in Kiev. Winners have a total of 180 days from the draw to claim their prizes—lest their winnings be forfeited. Ukraine Megalot is known for offering impressive 2nd place prizes. The 2nd place tier is known as the Megapriz—with winnings that also amount to millions. Like many lotteries, a portion of Ukraine Megalot’s lottery funds go to the Ukraine state budget. The proceeds then go help various charities and other social projects. In 2013 alone, nearly UAH20 million was contributed by the MSL to the two aforementioned types of projects. Are YOU ready to be the next Megalot winner? Ukraine Megalot may not be on the same level of international fame as Powerball or Mega Millions, but it is one of Ukraine’s biggest and most popular lotteries for a reason. Not only do you get the chance to win impressive prizes—thanks to uncapped rollovers—you also have eight ways to win (plus two days a week to play). And even if this isn’t a lottery like Eurojackpot—which was designed to produce as much winners as possible—you’re still looking at some fairly good odds (not to mention lump sum payouts).